When brewing,you need to maintain perfect sanitation to enhance the taste and quality of the beer. A flawless homebrewing process relies on the right equipment and hardware fittings. In a brewing process, sanitary installation plays a vital role in the quality of the final brew. Most of the brewers, therefore prefer tri-clamp fittings that are designed without any pockets or nooks which can entrap fluids. 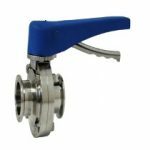 They are easy to clean in place without disassembling.You can also use quick disconnect fittings that have an O-ring which is integrated into the QD body or plug of the valve. When brewing, the wort may get entrapped in the O-ring of the disconnects. This component is also usually vulnerable to premature wearing and leakage. Due to this, they need consistent maintenance routines. The tri-clamp valves do not require these hassles because they are easy to clean and install. Since the tri clover valves are designed to allow easy assembly and disassembly during the brewing process, they are built with precision and perfect sizing.These valves provide a better leak protection due to a gasket or seal used in their design. The stem packing is strong and adjustable to make tight connections. To ensure leak-proof operations, you need to select the sizing of the valve according to the outer diameter of the pipe or tubing to which they are intended to be connected. The best quality tri-clamp fittings are designed with precision to match requirements of 3A standards. These standards are followed globally for designing the perfect fittings for making sanitary connections. Under these standards, it is specified that the fittings shouldn’t have any expose threaded connections. Rather, they should have a seal or gasket for connecting to threaded fittings. the Connections should also not be made between tri-clamps and NPTs. These standards provide guidelines regarding the internal diameter as well. When looking to buy them for your brewing project, you should check if the manufacturers follow these standards. These are the main reasons that make the tri-clamp fittings a preferred choice for the brewing processes where sanitation is vital.